We, at Srujanavani, believes Education is the only area where we have to invest our resources, to reap the benefits of the humankind in addressing societal maladies. 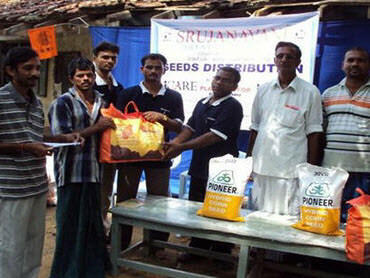 Rural Development Programme (IRDP) is an ambitious programme taken up by Srujanavani. The first project was launched in the tribal areas of Madugula Mandal of Visakhaptnam District, Andhra Pradesh. All the activities taken up in Urban areas have been brought together under one umbrella called SPOORTHI. Activities like YAP (Youth Awareness Program), Free Learning Centre, General Awareness camps, Plantation drives, Blood donation camps and so on falls under this roof. We believe in molding socially responsible individuals in building an invincible Indian state studded with virtue and wisdom. Srujanavani has always been very responsive towards natural calamities with our meticulous relief and rehabilitation activities. We have proved our metal by reaching the deepest corners.